"Pierre Deux" border print enhances red calico print in this flared party dress, featuring ruffled and elasticized puff sleeves, cowl neckline, overlapping back closure with four antique green buttons. 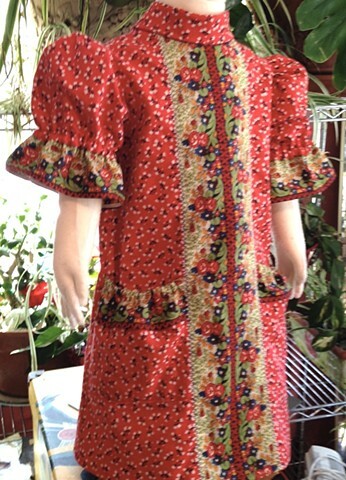 Size Pre-School (3-4 years), measures 23" chest, 21" length. $60, fits 18-24 months. 100% cotton, made in the USA by the designer herself, shipped free to any address in the U.S.